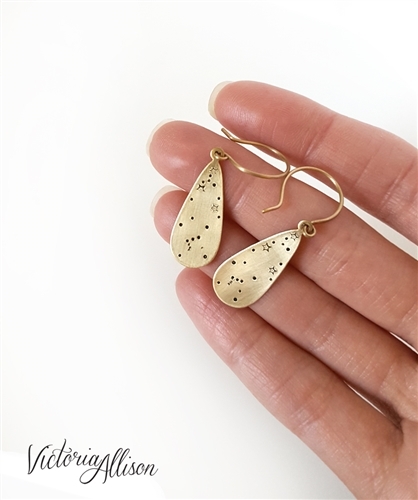 These small brass teardrop earrings feature the Orion constellation with additional teeny tiny individually stamped stars around them. 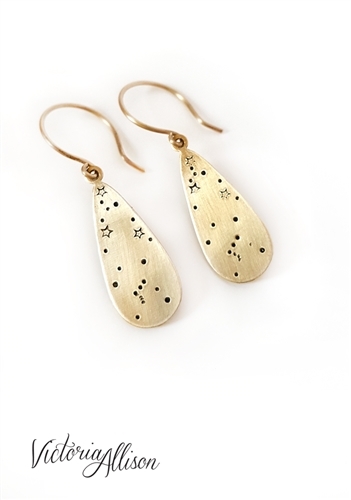 The earring hooks are also brass. 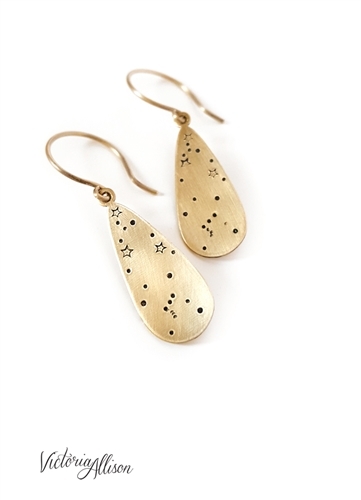 These Orion constellation earrings are very lightweight, and are great for those who love dangle earrings but can't wear heavy ones! I have individually stamped the little stars onto the front of each brass teardrop. I then went through a finishing process of gently sanding, oxidizing, buffing, and lightly polishing the pendant, finishing it with a lightly textured matte surface with a subtle shine. I've coated the teardrop charms in wax sealer which will help keep them brightly colored, but please note that brass will develop a patina over time. Please see "Care" guide below. The earring hooks are brass, which I have made by hand. You can use a soft polishing pad/cloth [made for brass jewelry] if you wish, but do note that brass naturally oxidizes over time with exposure to air, perfumes, lotions, etc. and will develop a darker patina. I have coated the pendant in a thin layer of wax sealer which will help delay the patina. I recommend keeping your jewelry dry and putting it on last when you're getting ready for the day.